8th prize 350 miles Apple Cup 2018. 21st prize 350 miles Apple Cup 2018. 6th place 209 miles Apple Cup 2018. 25th prize 360 miles Triple Crown 2018. 23rd prize 300 miles Triple Crown 2018. $ prize winner 350 miles Hoosier Classic MDR 2018. Only 6 USA pigeons on the day. 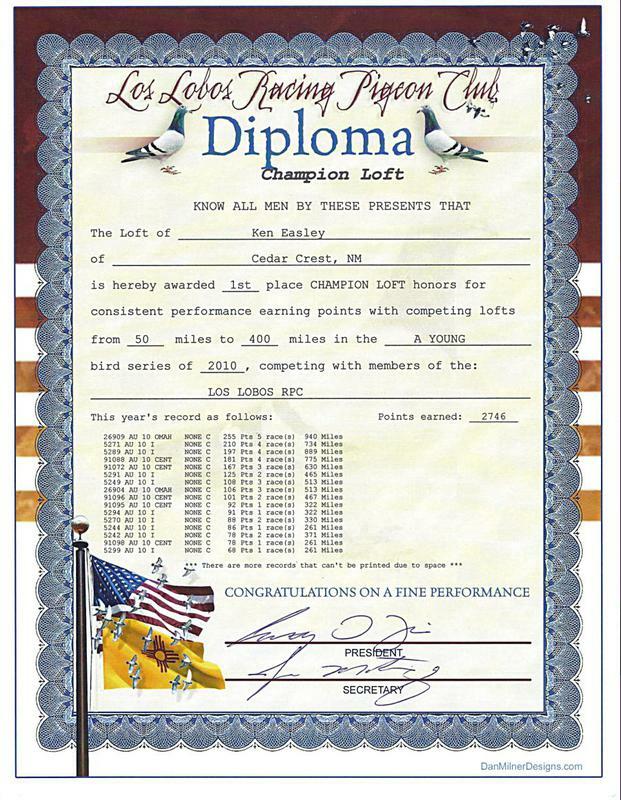 1st Place USA One Loft Race Coefficient Winner 2017. 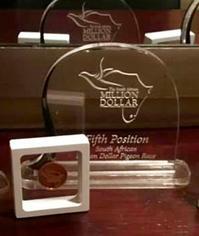 2nd Place Dollars won per bird sent USA 2017. 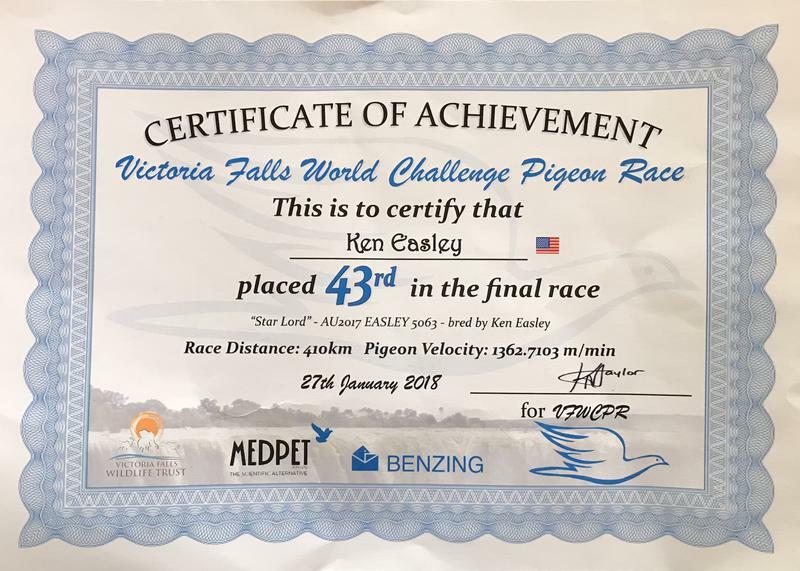 46th place 1184 birds Hot Spot 4 - Victoria Falls Dec. 30, 2017.
e1st - 3rd prize 250 miles Dehesia Trials. Dec. 20, 2017. 7th prize 350 miles Iron Eagle -Triple Crown. 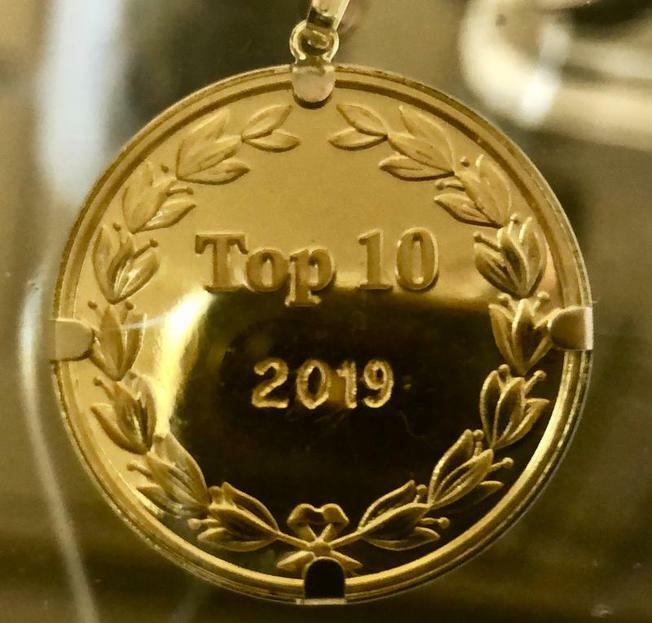 10th prize 305 miles Triple Crown. only 17 day birds. e1st - 2nd Prize Triple Crown, $7,000. e1st - 7th trap 350 miles Hoosier Classic $18,277. 5th prize 353 miles 1 min. 47 seconds from 1st. 2nd prize 307 miles 3 minutes & 57 seconds from 1st. 10th Ace Pigeon Silvercreek Quad. 5th at 350, 2nd at 307, 32nd at 307, 12th at 250. 2 x e1st by 6 seconds and 15 seconds 3rd and 6th to trap 376 birds. 267 miles with 15-25 MPH headwinds. Apple Cup. Only 65 day birds. 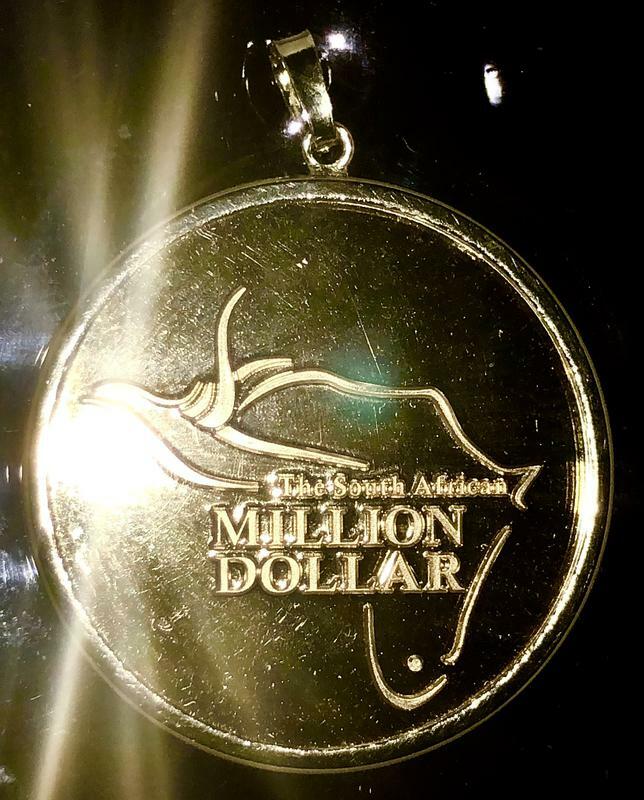 Million Dollar Race South Africa Results 2017.
e1st - 5th to trap by 15 sec. 5th HSCR 2800 birds. SAMDPR 2017. 2nd Country Challenge HSCR 4 SAMDPR 2017. 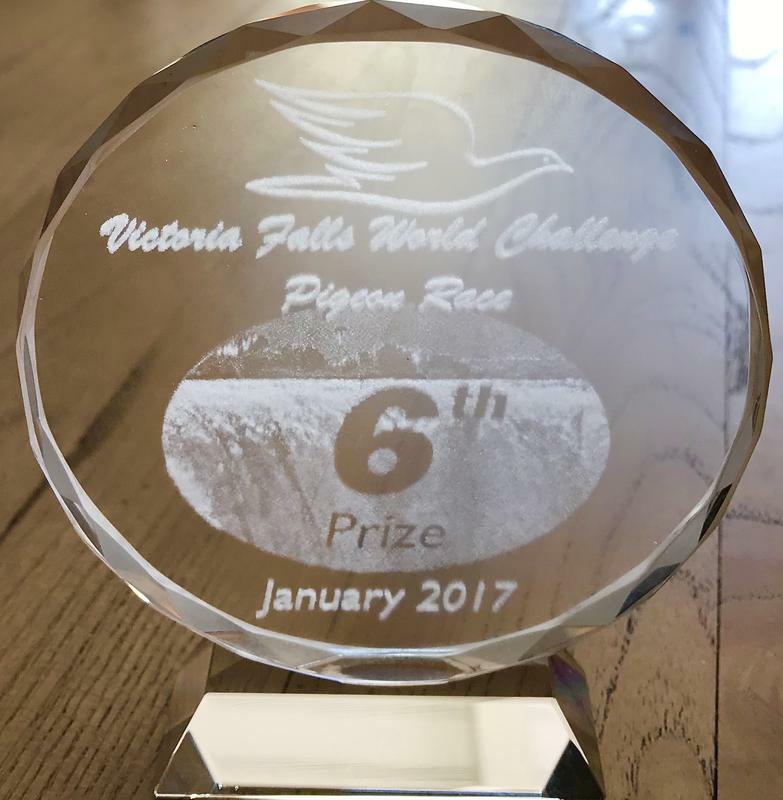 6th Prize Victoria Falls final race 2017. Ken Easley - Rolf Schloemer $15,000. e1st prize 250 miles Arizona Classic Dec. 2016. 3 bird team. 15th prize 350 miles. 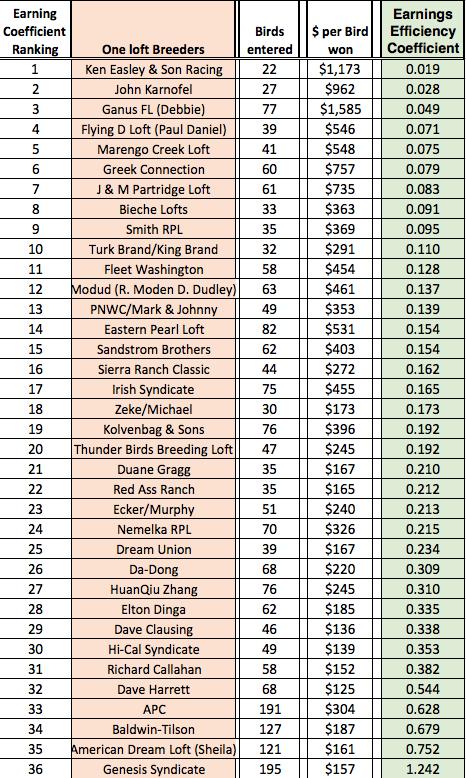 9th grand Averages. AIC 2016. Flew only 1 pigeon! Son of Konbird and 5289. Only 2 birds flown. 16th place 363 mile Iron Eagle 2016.
e1st prize 200 miles Triple Crown 2016.
e1st 100 miles Triple Crown 2016. ​2nd 505 km USA Golden Race Portugal 2016. Only 3 birds sent! 2nd USA Grand Averages Golden Race Portugal 2016. 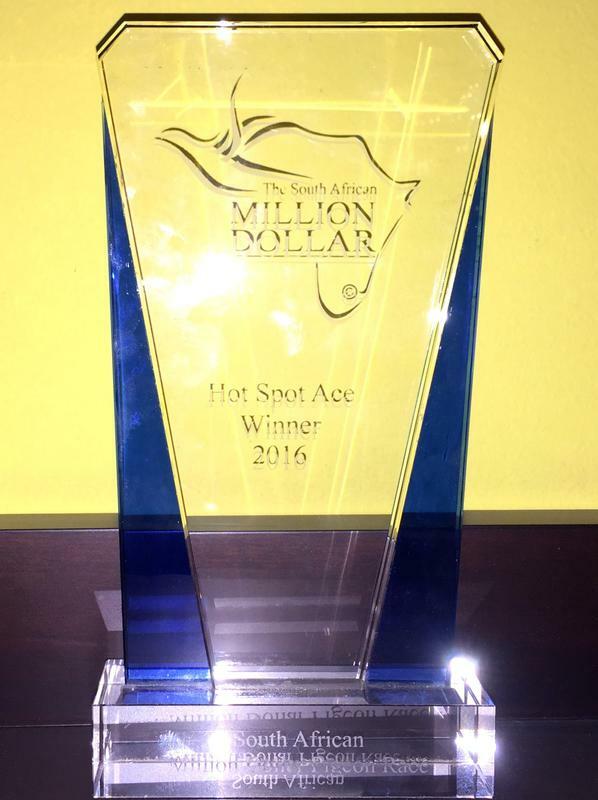 1st Hot Spot Ace Winner Average Speed - 2016. SAMDPR 6 min. lead. $35,000 in prizes and nominations. Only 9 birds, 5 finished. 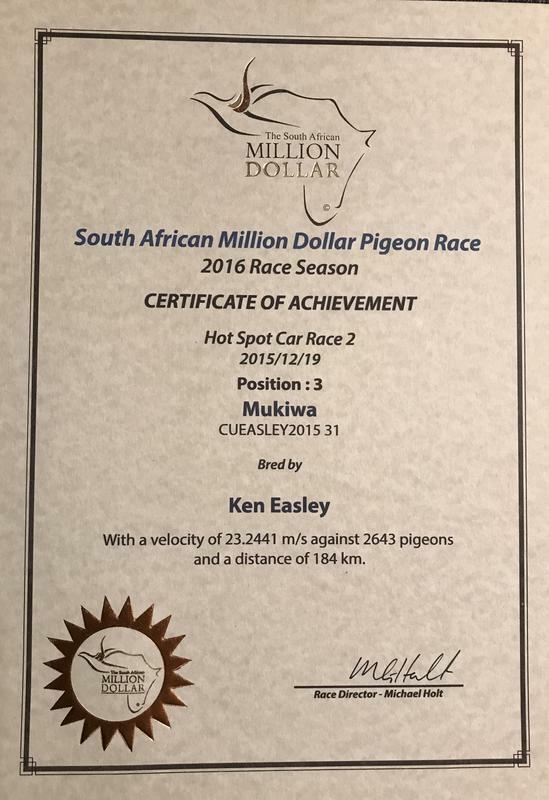 1st Country Challenge Winner 5th car race, 230 miles 2287 birds. 3rd Country Challenge winner Final Race. 3rd Country Challenge winner 4th HSCR. 83rd prize Final MDPR 336 miles 2161 birds. 3rd prize Car Race 2 SAMDPR - 3 sec. from 1st. - 1st drop. 11th prize Car Race 5 SAMDPR - 4.5 sec. from 1st. - 1st drop. 17th prize Car Race 4 SAMDPR - 40 sec. from 1st. - 1st drop. 20th prize Car Race 4 SAMDPR - 90 sec. from 1st. - 1st drop. 111th prize - Car Race 3 SAMDPR - 5.5 min. from 1st. - 1st drop. 138th prize - Car Race 1 SAMDPR - 2.5 min. from 1st. - 1st drop. 1st prize - 350 miles, also 9th and 11th with all three full brothers and sisters off Easy Money, son of Konbird and Blue Power. 1st prize 300 miles 501 birds. Also 7th prize. 7th - 161 mi. 51 seconds from 1st. 3rd & 6th - 209 mi. 3 & 8 seconds from 1st. 4th - 267 mi. 6 seconds from 1st. 15th & 17th - 267 miles. 1st three birds from our team on the 300 miles are all siblings from Easy Money, son of Konbird & Blue Power. 1st prize 350 miles with 9.5 minute lead Ryan, Tx. Son of Robbe Jr. & Witte Zatopek. 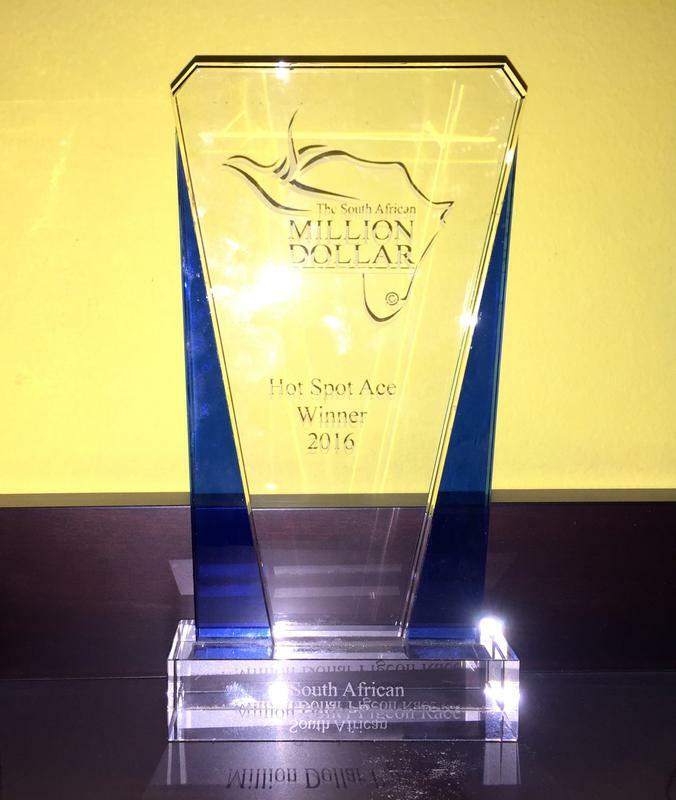 10th prize 350 miles from Triple X son of Konbird & Dibaba & Black Soul Hardy Kruger. 4th, 9th, 12th, 16th, 25th, prizes 255 miles Tornillo, Tx. 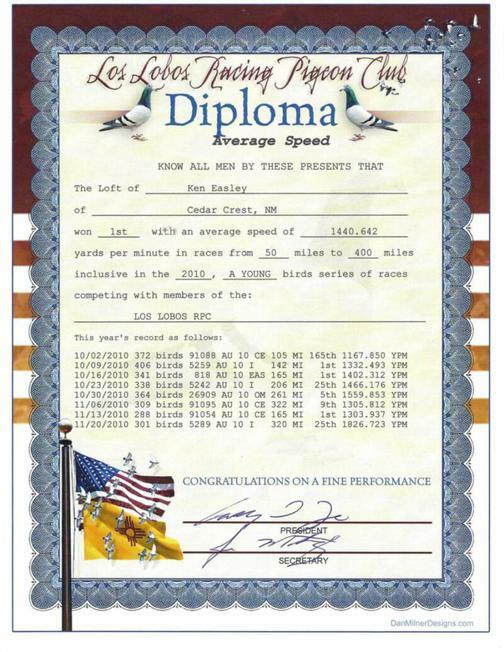 5th Prize 200 miles Radium Springs, NM. e1st 225 miles the week before in Oct. 225 miles. bred e1st 300 mile California State Race. e1st drop 300 miles Americas International Challenge Nov. 2014.
e1st ​drop 225 miles Americas International Challenge Oct. 2014. 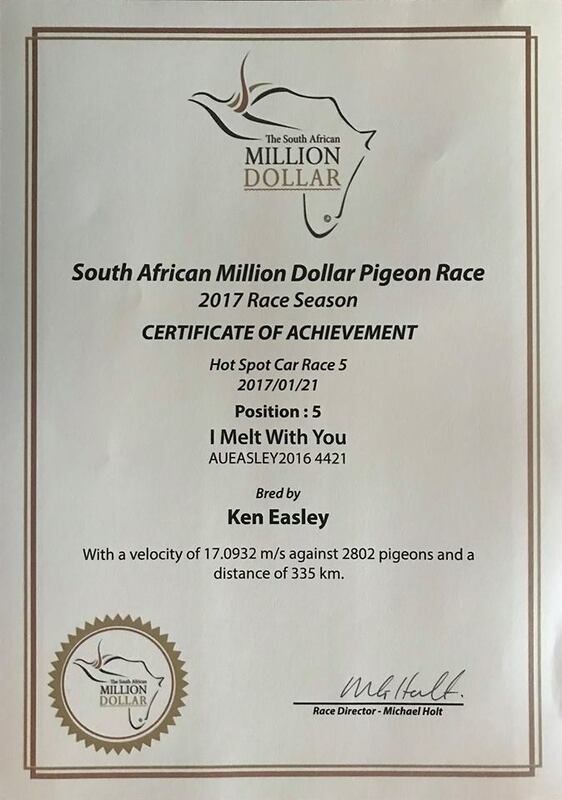 7th Grand Averages Ace pigeon - Million Dollar Pigeon Race 5808 birds!!! 2nd US Grand Averages 951 birds. 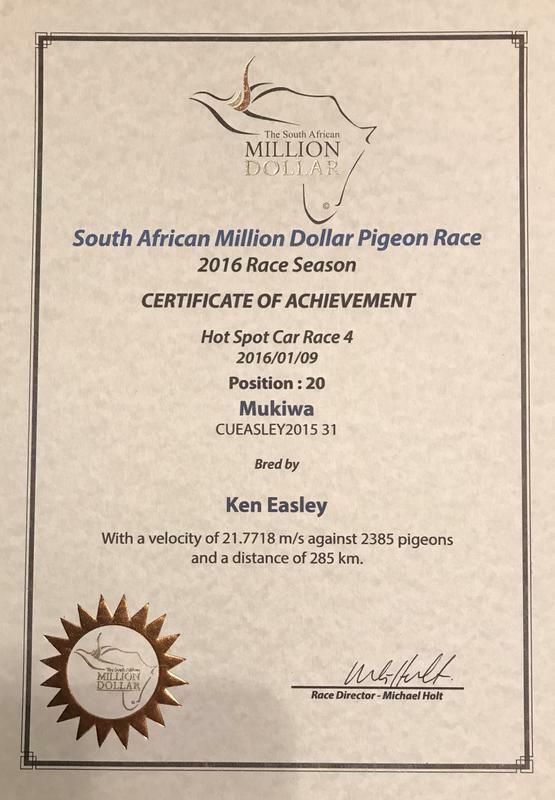 35th Prize final race 661 km (411 miles) 3478 pigeons - Only 53 day birds. Head winds. Full Brother bred the 38th place. Konbird bred 43rd place in the final also leading to the Breeders cup win by my team mates on that race John Karnofel and Mike Fletcher. Son of Konbird & Blue Power - EZ Money, bred 1st 350 miles Fall Classic winner for Nhia Lor. Also son Konbird x Blue Power - EZ Money bred 8th place in the same race. EZ money bred e1st drop 370 miles and 8th to trap Sierra Ranch Classic. Son of Konbird x Species bred e1st Canadian International silver cup 325.
e1st Canadian International 100 miles, e1st 110 miles. e1st California Late Hatch Classic 177 miles. 1 second from 1st to trap. Also 18th by nest mate 11 seconds from 1st to trap. 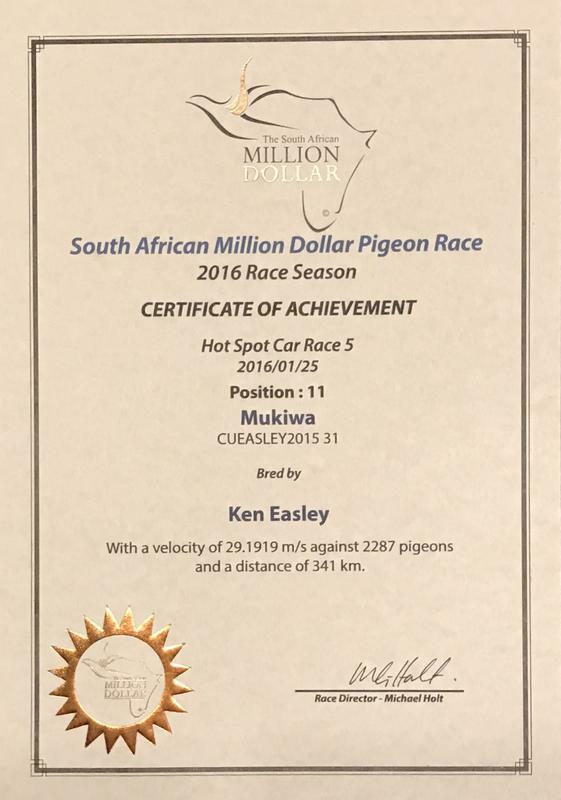 Same pigeon won 18th on the 300 miles & e1st on the 375 miles Platinum Cup. 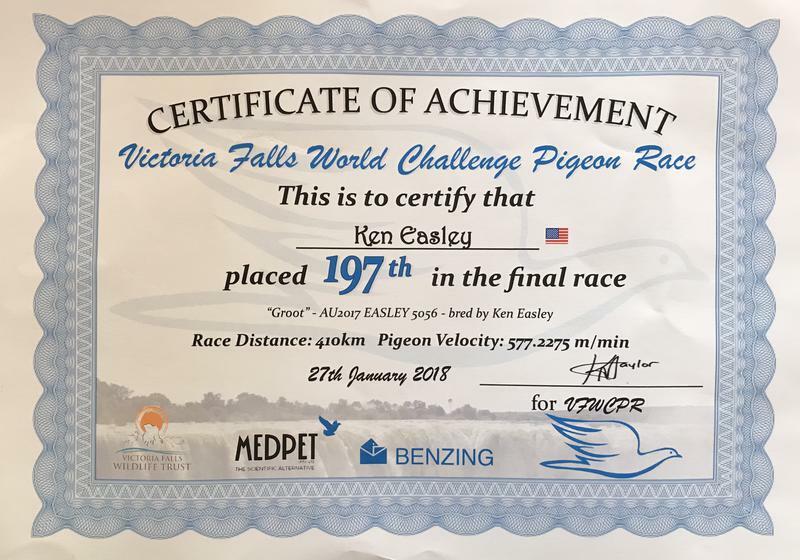 Same pigeon 1st on the 75 miles training race. 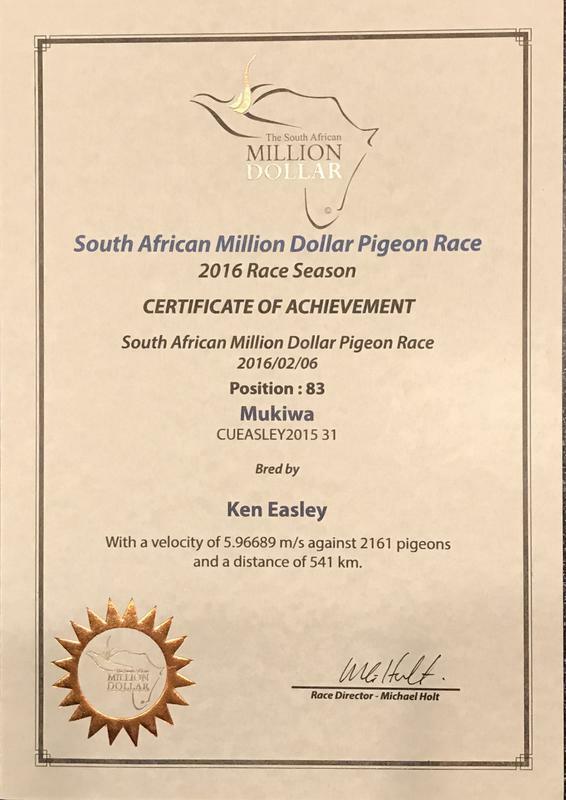 Also money winner in the final 370 miles, same pigeon. e1st America's International Challenge 300 miles. 12th Plymouth Peak Pro Challenge 281 miles. 5th place North Florida One loft Race 300 miles. e1st North Florida One loft Race 150 miles. We also bred & Entered "Blue Water Dutchess"
1 of only 84 birds left in the Hot Spots Races from 5461 birds. 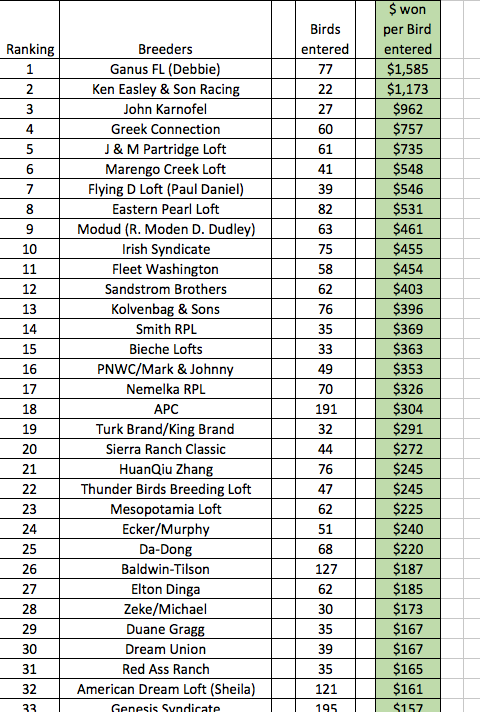 9th Grand Average after 26 Races - 5461 birds. 37th in the hot Spot Averages from 3616 birds. AU 11 Easley 3435 1st 400 miles 2083 birds, 97 lofts, 1806 YPM. Gulf Coast Homing Club. with AU 11 Easley 3434 from our Klaas line. He had 2 x Equal 1st. 3rd Champion bird of the Plymouth Peak Pro Challenge 102 lofts. AU 11 Easley 3436!!!!! She had 3 x equal 1st. 1st, 2nd, 3rd, 4th, 5th, 6th, 7th 8th, 9th, 10th 11th, 12th places out of 450 birds. 1st, 2nd, 3rd, 4th, 5th, 6th, 7th 9th, 10th 11th, 12th, 13th, 14th, 15th, 16th - 341 birds. 1st, 2nd, 3rd, 4th, 5th, 6th, 7th 8th places out of 288 birds. 7 National AU Ace Pigeons, 3 AU National Hall of Fame pigeons. 26 e 1st and 4 pure 1st place. 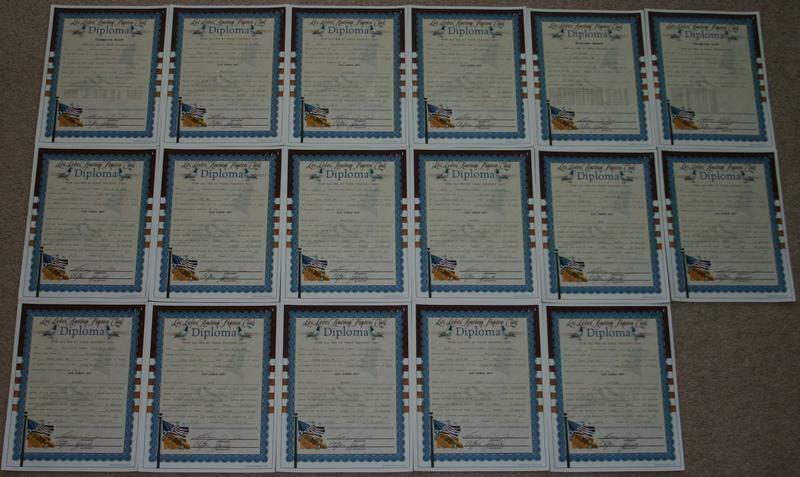 38 diplomas for race winners. 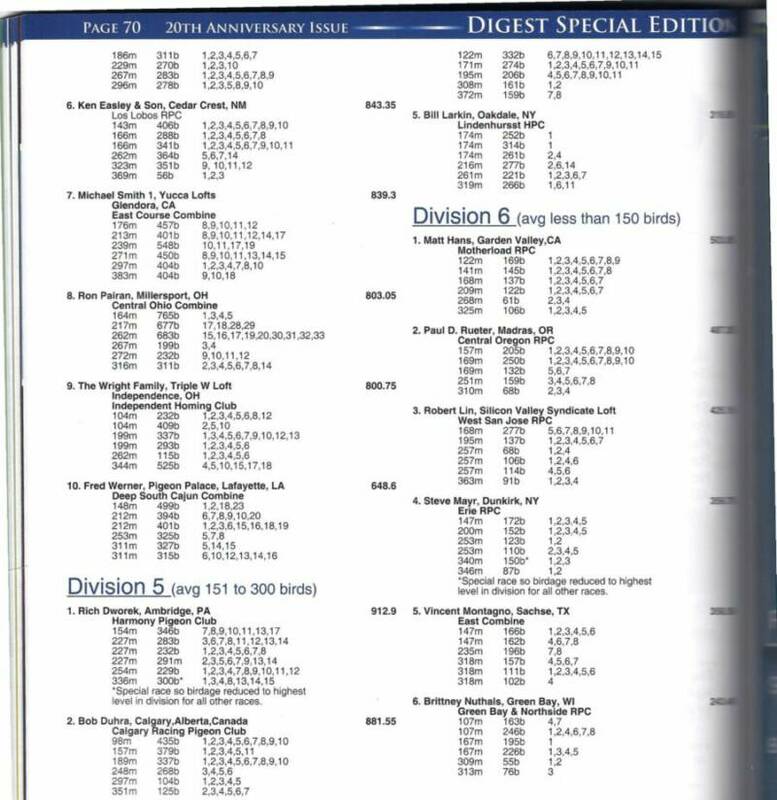 6th in all North America 2010 Young Bird Digest Ace Lofts, which includes all USA & Canada. 2010 - Vegas Race 2nd Average Speed Ace, 2 x e-1st on the 250 mile race and 6th on the final 307 mile race against pigeons from UK, Germany and all over the US. 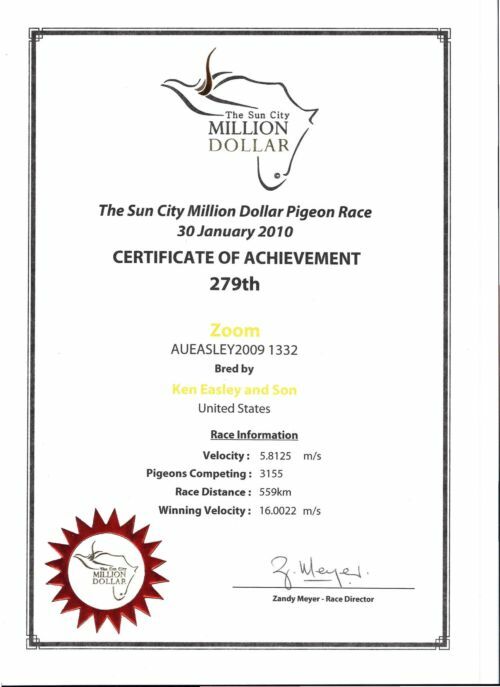 2010 Sun City Million Dollar Pigeon Race - Ken Easley & Son win Money on a tough final 357 mile race with Nest Mates! W Z Express and Zoom win against 5000 pigeons from all over the world competing. That is rare and shows the quality of these two pigeons. 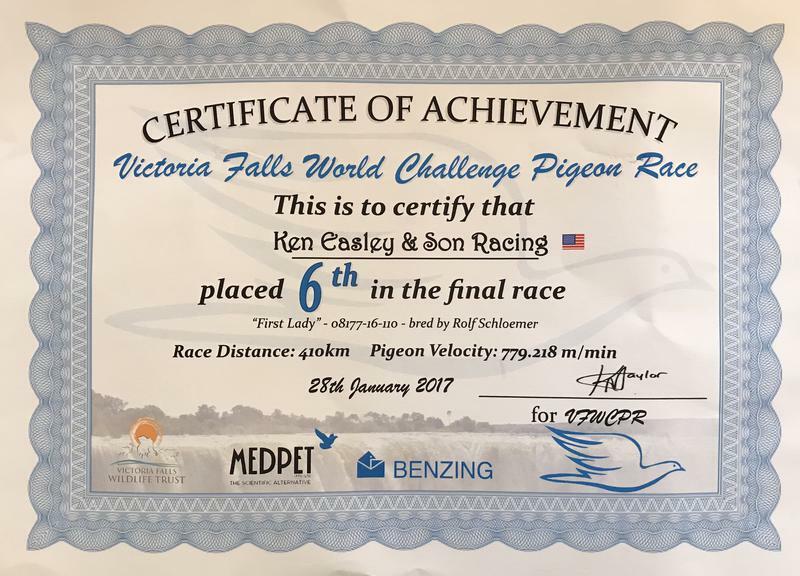 3155 pigeons in the final race!!! 1st place 250 miles - 368 birds.